I just got this chance to review myPhone Tw1 Duo after I have tested it yesterday from a friend. But I haven’t made an actual shot,maybe next time around. 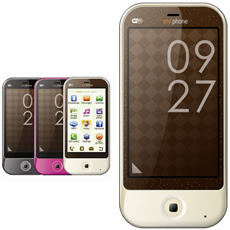 myPhone Tw1 Duo is a full-touch Dual-SIM handset with 3.2” screen(240 x400p) display and trackpad for navigation. It’s Java-capable (enjoy gaming! ), Wi-Fi ready, with Bluetooth, Micro USB 2.0 and 3.5mm jack for Audio. myPhone TW1 Duo has a 3.2MP Camera (good camera, no flash), you can phonebook over 1000 entries and supports up to 8GB of TransFlash MicroSD. It has Media Player (MP3/MP4),Sound Recorder, Yamaha Amplifier, and SRS WoW HD. Also has WAP 2.0 browser, YM, Facebook, Twitter, Google Search, Gtalk, Opera Mini, eBook reader apps, etc. Available in three colors: coffee, black and pink. myPhone TW1 has no mobile TV. I am not sure if it has a theme options. *Unresponsive Touch-most often touch don’t work effectively (not so resistive) while browsing the Google Search or gaming you need to press it hard (resulting to screen scratches). *Downloading from content from Opera Mini won’t work. For buyers, myPhone Tw1 Duo would cost around P3,488 with 1 year warranty.